Sara Pennypacker's two bestselling Stuart books are now available in one paperback volume which features full-color illustrations - THE AMAZING WORLD OF STUART! 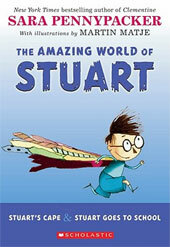 STUART'S CAPE - Stuart and his flaky family have just moved to town, and there's plenty to worry about. Stuart is very good at worrying, but not so good at waiting. Impatient for an adventure, he makes himself a cape from a hundred old ties and from then on, he has one preposterous adventure after another.